When Muslim ‘Save Cow’ activists inspire their Hindu Counterparts through ‘Gau Seva Sadbhavana Padyatra’. Muslim ‘Gau bhakt’ on 12,000 km padyatra from Kashmir to Kanyakumari. 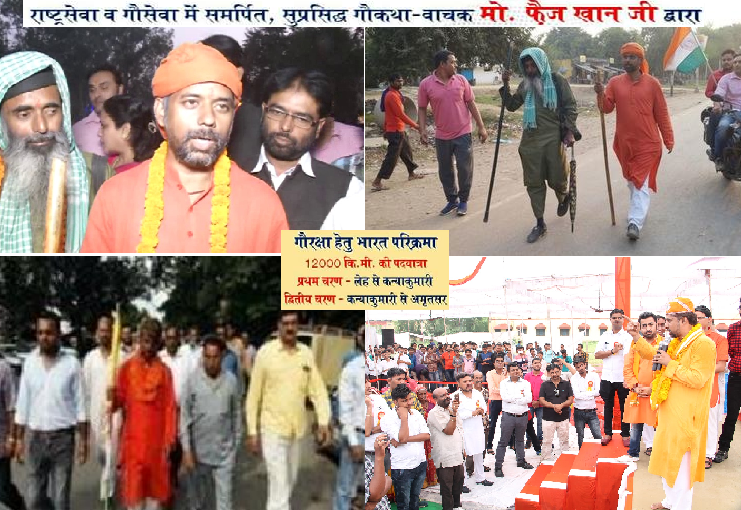 Binay Singh | TNN | Varanasi | Nov 2, 2017:: Amid violence and politics in name of ‘gau raksha’, Mohammed Faiz Khan from Raipur is on a 12,000 km Leh-to-Kanyakumari march — ‘Gau Seva Sadbhavana Padyatra’ — to generate mass awareness about cow protection, cow rearing, medicinal qualities of milk and its products. He covered a distance of 2,100 km to reach Varanasi in 130 days and left for Mughalsarai on Wednesday. Covering 20-25km per day, he is expected to reach Amritsar in January 2019. He said that the main objective of this yatra is to spread the message of communal harmony through the ‘seva’ (service) of ‘Gau Mata (cow). “We should serve and protect the cow, which is the saviour of mankind,” he said adding that it is unfortunate to see violence in the name of cow protection. “I began the journey from Leh on the occasion of ‘Sindhu Darshan Utsava’ on June 24,” Faiz told TOI while leaving for Mughalsarai. “The yatra will be done in two phases. Jammu and Kashmir, Himachal Pradesh, Punjab, Uttarakhand, Uttar Pradesh, Bihar, West Bengal, Odisha, Jharkhand, Chhattisgarh, Maharashtra, Telangana, Andhra Pradesh, and Tamil Nadu will be covered in the first phase, while in the second phase from Kanyakumari to Amritsar the yatra will pass through Kerala, Karnataka, Goa, Maharashtra, Madhya Pradesh, Gujarat, Rajasthan, Haryana, Delhi and Punjab,” he added. Earlier, Faiz also held a series of ‘gau kathas’ (discourses on cow) at various places to highlight the importance of cow. He said a novel, ‘Ek Gai ki Atmakatha’, inspired him to dedicate his life for the cause of the animal. Instead of going to madarssa, Faiz received his primary education in Saraswati Shishu Mandir in Raipur and did MA in Hindi and political science. After teaching at a government college for two years, he left the job and set on a journey to save cows. During his four-day stay in Varanasi, Faiz took part in programmes organised by various organisations all over the city. The yatra has been organised by the Muslim Rashtriya Manch affiliated to RSS. This entry was posted on November 2, 2017 by hinduexistence in Ban Cow Slaughter, Ban Cow Slaughter in Bharat, Cow Protection, Goraksha, Save Cow Movement and tagged 12000 km padyatra from Kashmir to Kanyakumari, Gau Seva Sadbhavana Padyatra, message of communal harmony, Mohammed Faiz Khan, Muslim ‘Gau bhakt’ on 12000 km padyatra, Muslim ‘Gau bhakts’ on 12000 km march across India.